There was a king called Pallavan who was ruling Thondaimandalam. He had kanchipuram as his capital city. He was devoted, generous, virtuous, truthful and famous. He came to the banks of the east coast ( Bay of Bengal). There he worshpipped Varaha swamy at Thiruvidandhai ( Kalyanapuram).. He resolved to do a kannikadaanam everyday. All the poor were very happy. They took their daughters to the king who married them off to suitable grroms. Thus all the brides in that place got married.. There was no more girl to be married off. Now whatr would happen to this king’s resolve? At this time a groom came along with his bride and other relatives to the king asking him for help. The king asked him thus “ Who are you? You look so beautiful? What is your name and which is your gothra? Where do you live and whose daughter is this girl? The groom replied happily “ Oh King, My name is Nithyakalyana. I belong to this village and am of the Kashyapagothra.. I have learnt all the Vedas and Vedangas. This girl is Komalavalli and she belongs to the Bhargavagothra. Please marry us off and be bestowed with praise. The King also did as requested. He gave them enormous wealth. After the marriage he was unable to send them off. 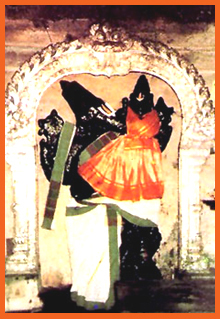 The bride and the grrom ntered the temple of Varaha swamy at the village. Having entered the sanctum sanctorium Nithyakalyana and Komalavalli disappeared. The King was stunned and had tears in his eyes. He worshipped the Lord. The Lord said “ Iam pleased by your resolve to marry off poor girls to suitable grooms. Do not worry that there are no more prospective brides. Conduct my kalyana uthsava everyday and beget prosperity. Thus the king began performing the Lord’s kalyanothsava everyday. Those who perform kalyanauthsava here will get married soon.